ETA Nick Policelli, far right, with his friends at ETA Thane Dunn's show, April 28th, 2018. ETA Nick Policelli. Photo provided by N. Policelli. My interest in Elvis began when I watched the movie “Roustabout” on television around 1966. I was very impressed. I started listening to vinyl records and singing along. At parties, I would play cassette tapes and sing along with Elvis to entertain people. When karaoke came along, I sang on a regular basis. Later I progressed to open mic with live music. I tried to style my hair like Elvis and to imitate his look. My biggest stumbling block was that I did not know the words. More recently, I started doing songs in competitions, pubs, and legions. This year will be my fourth time performing at Collingwood. I strive to do better, and hope to improve. Nick Policelli lives in his neat bachelor apartment in downtown Hamilton. He would have loved to be in Graceland this year, but could not afford it. He was in Collingwood though, on stage. It was his third time. Nick Policelli is a soft-spoken man. "I've been shy all my life," he says. “And so was Elvis." Being shy has hurt him in the judging. "On presentation, I got as low as 3. Some say I was not loud enough. I was too quiet. I was nervous." This year, he went to the festival as one of a dozen tribute artists who chose the "non-competitive" category. Nick did not want to be judged. "I just felt driven to be the best I could be." For years he worked for the city of Etobicoke, as a gardener, then a custodian. Along the way, his marriage broke up. He decided to change his life. He had the bump taken out of his nose. And he took care of that receding hairline with a toupee--jet black. Buddies at work started to say, "Hey, Elvis." 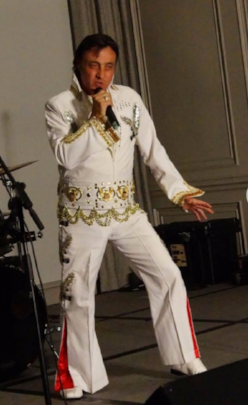 Next thing you know, Policelli was singing "Heartbreak Hotel" at a retirement party, and karaoke, too. And he would drive a cab in leather, singing Elvis. Fares became fans. He left his steady job, and got some small acting jobs. But Elvis comes first. This spring, he spent $475 that he could ill afford on a gold lamé jacket. He wore it on the Collingwood centre stage before a sea of Elvis fans. He was nervous, and afraid he would forget the words; so he set the lyrics at his feet. It was his first time with a band backing him up. He sailed through "All Shook Up”. The crowd liked him. Policelli would love to make this a career, but knows he has far to go. And he is now 61. "Maybe one day I'll have to give up." Or maybe he'll be like Elvis, who never really left the building, not even after that steamy afternoon in August four decades ago. Paul Wilson, Hamilton Spectator.